Avery was born March 16th at 6:12 am in Iowa City, IA. Jennifer was there for the delivery of our 4th adopted child. It happened very unexpectedly! I was actually still on vacation with our boys because we didn't think it would happen this early. 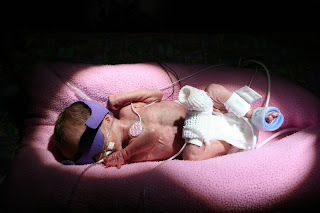 She was born 10 weeks early and weighed 2 pounds 4.7 ounces and measured 15 1/8 inches long. She is very tiny but doing really well. Jennifer and I are very excited to have her in our family. 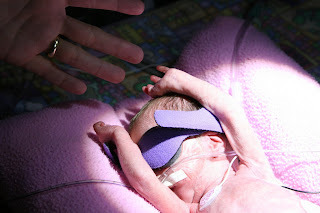 I have attached some pictures below to show you how small she is. It is amazing that something so small can have so much detail and work so amazingly. I am sure that later Jennifer will post the story of all the things that went wrong and all the things that fell into place to make this happen. We are so thankful for the people that we have met in Iowa that have treated us like family and made this a great experience for us. She does have a little bit of jaundice so they have put her in the spotlight. If any of you know all the medical words for this stuff and those lights then just pretend I wrote them here. She was in the middle of stretching. So far we have had 2 nurses tell us "Ohhh, she does not like to have a wet diaper!" Check out the toes. So small. That's Jennifer's pinky finger. 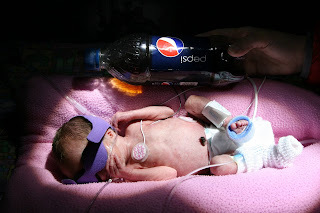 Just to give you an idea of her size we used this 16oz bottle of Pepsi (worlds greatest beverage according to Jason). We will be staying in Iowa City for about 8-12 weeks before they will release her from the hospital. We are currently searching the area for a place to stay so we can bring our family here and be close to Avery since she can't leave. It will be crazy, but it will be an adventure.